관음보살은 여러 가지 모습으로 변하여 중생 앞에 나타나 자비를 베푼다는 의미를 지니고 있는 보살이다. 가로 53㎝, 세로 86㎝ 크기의 이 수월관음도에는 관음보살이 사는 화려한 정토(淨土)의 모습이 잘 묘사되어 있다. 중앙에 표현한 관음보살은 바위에 왼쪽으로 비스듬히 걸터 앉아 선재동자를 바라보고 있는 모습이다. 관음은 풍만한 얼굴과 섬세한 이목구비를 가지고 있으며, 가는 눈과 작은 입 등에서는 부드러우면서도 근엄한 인상이 풍긴다. 머리에는 화려한 보관(寶冠)을 높이 쓰고, 몸에는 투명하고 부드러운 옷과 화려한 팔찌·목걸이 등을 표현하였다. 등 뒤로는 한 쌍의 푸른 대나무가 보이고 바위 끝에는 버들가지가 꽂힌 꽃병이 있으며 그 주위를 둥근 광배(光背)가 둘러싸고 있다. 관음의 발 아래에는 붉고 흰 산호초와 연꽃 그리고 이름 모를 꽃들이 화려하게 피어 있다. 고려불화는 전 세계에 80여 점이 남아 있다고 하는데 우리나라에는 4∼5점만이 전한다. 이 수월관음도는 섬세하고 화려하면서 우아한 종교적인 아름다움과 격식을 지닌 작품으로 고려불화의 특징을 단적으로 보여주는 귀중한 작품이다. Avalokitesvara is a bodhisattva who appears before the people and leads them from the world of agony to the world of happiness. This painting (53 cm wide and 86 cm long) properly depicts the Western Pure Land of Ultimate Bliss where he lives. Avalokitesvara Bodhisattva is sitting aslant on the rock, looking at a Zenzai boy (Sudhana Kumara) who visited the bodhisattva. He is wearing a magnificent jeweled crown and a soft transparent robe with gorgeous ornaments such as necklaces and bracelets. There are a couple of bamboos behind him and a vase filled with willow branches on the rock, which is surrounded by the round halo. Under his feet are red and white coral reefs, lotus flowers, and other flowers in full bloom. Avalokitesvara has a plump face as well as fine features, and his thin eyes and small lips appear to be dignified and gentle. Approximately 80 Buddhist paintings from the Goryeo Dynasty remain around the world today, but only four or five pieces are in Korea. 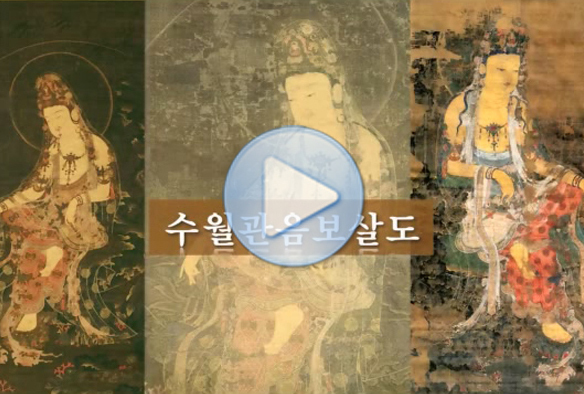 This painting shows the graceful, refined beauty of Buddhist paintings of the Goryeo Dynasty.